Locally known as the Kroger Via Ferrata, Eric and I had done this route the previous year and found it great fun. Following our glowing report, Steve was interested in giving it a try, so we made plans to do it again this year, early on Tuesday morning. Starting by 7:30a had several advantages - in addition to being in the shade for the duration, we had the route virtually to ourselves. It wasn't until we had nearly finished the route that we ran into a solo climber going in the opposite direction. It turned out he was the local photographer, setting up shop at the most exciting part of the route to take pictures as the guided groups went through. After finishing the route in the standard south to north direction, Eric declined to join Steve and I as we reversed the route. This was partly to save us having to climb back up the road to the car, but mostly because it was more fun than taking the trail and road back. We crossed paths with 4-5 guided groups in reversing the route, but none of it caused us any real delay. We had gotten past the exciting sections before running into the first group. Good fun, this one. Wanting to get more exercise in, I suggested an outing to Hawn Mountain, off the Last Dollar Road northwest of town, to which both Eric and Steve readily agreed. I expected the hike to be short and miserable, a 1,500-foot climb over less than a mile horizontal distance, up loose talus slopes. I didn't really express this before we drove out that way, but it became clear as we neared the peak and could see acres of talus covering the southwest side of the mountain, nearest the road. There was a spur road forking off the Last Dollar Rd that looked to head higher, so we started up there. Unfortunatly it looked to be an upscale subdivision and I turned around before we got too far, choosing to park down at the junction where two other cars were parked. Eric and Steve weren't too happy about this - after all, I was the guy who normally doesn't worry much about trespassing. But as I explained, I wasn't too interested in trespassing in another state where retrieving a towed vehicle could be more problematic. Eric decided to do a google search for "Hawn Mtn Trail" almost as a joke, and surprised us all when it found a hit. 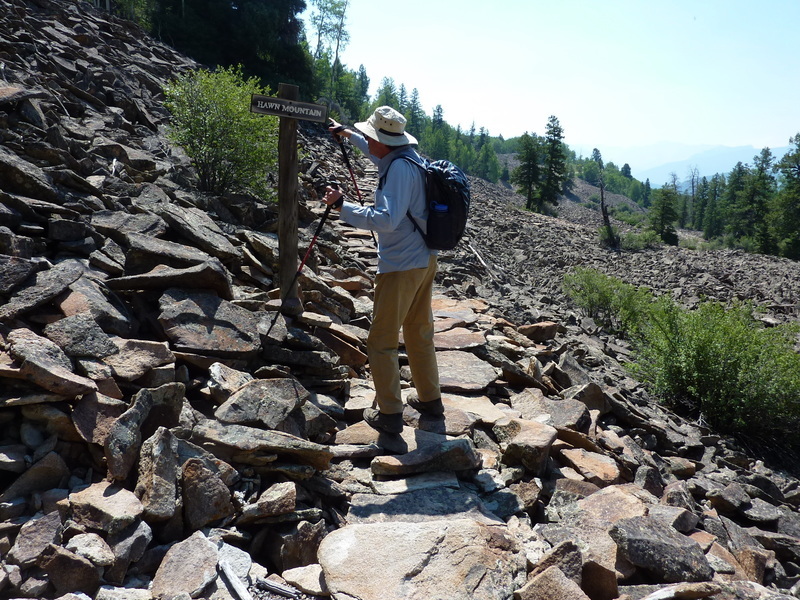 Not only was there a trail going to the summit, it had the idyllic name of "Stairway to Heaven." Even better, the online report had a picture of the TH which was right where we parked. There are private equestrain/hiking trails in the development that are signed for "use at your own risk", one of them where we parked. So it seems we'd have stumbled upon the trail with or without the internet search.